It's easy to see how Chicago, Burlington & Quincy president Ralph Budd found the name for his most celebrated train. He had been reading one of the world's great literary works, The Canterbury Tales, which begins with pilgrims setting out on a journey, inspired by the budding springtime and by Zephyrus, the gentle and nurturing west wind. What better name for a sleek new traveling machine than Zephyr? Budd certainly needed new winds to begin blowing for his railroad. When he took over the Burlington on January 1, 1932, the Depression was crushing the passenger rail industry. The wear and damage American trains sustained from overuse during World War I had necessitated huge expenditures on repairs and rehabilitation during the 1920s. Thereafter, in addition to suffering from depleted funds, railroads were facing increasing competition from the auto industry. Between 1926 and 1929, the 11,000-mile Burlington Route had lost a fifth of its passengers, and still another half of that between 1929 and 1931. Although the railroads would try to fight back during the 1930s and 1940s by acquiring bus and truck companies, little could be done, it seemed, to revive passenger train travel. Ralph Budd, who by 1932 had established a tremendous reputation for himself, determined to reverse this trend. Born on an Iowa farm in 1879, Ralph Budd had distinguished himself early on, graduating from high school and college in only six years, with a degree in civil engineering. He went to work for the railroads, first the Chicago Great Western and then the Rock Island, where a powerful mentor, renowned civil engineer John F. Stevens, recognized Budd's potential. At only 27, Budd joined Stevens on the Panama Canal project, where he successfully completed, ahead of schedule, a rail line across Panama's rough jungle terrain. Budd's Panamanian success attracted the attention of the Great Northern railroad's formidable president, James J. Hill. Budd's star rose quickly at the Great Northern, and at 40, he became the youngest chief executive of a railroad when he was named its president. At the Great Northern, Budd oversaw the construction of the 7.8-mile-long Cascade Tunnel in central Washington, the longest railroad tunnel in America at the time, and still one of the longest in the world. To build the tunnel, teams of workers bored through solid rock 24 hours a day, 7 days a week, for 35 months. The tunnel enabled trains to bypass some dangerous switchbacks in the mountainous area, and avoid avalanches. During the tunnel's construction, Budd installed stationary diesel engines to provide standby power to the workers underground. The engines were too heavy for use on a locomotive, but Budd was taken with their economy and dependability. As president of the Burlington, Budd would take another look at diesel power. The political climate of Franklin Roosevelt's administration, he said, fed his willingness for experimentation. Having campaigned in 1932 on a platform of social and public works programs designed to pull America out of the Depression, Roosevelt also promised rail-industry improvements. Joseph Eastman, Roosevelt's coordinator of transportation, said that in an effort to revive the railroad industry, Washington might be willing to relax antitrust regulations to encourage experimentation with methods, materials, and new locomotives. A new locomotive was waiting to be born in Philadelphia. In September 1932 Budd took a demonstration ride on the E.G. Budd Manufacturing Company's stainless-steel gas-electric car. Edward Budd had been an auto-body manufacturer before the Depression, and the auto industry would continue to provide technological inspiration to the railroads. Impressed with Charles Kettering's diesel engine prototype at General Motors, Budd also admired Pullman's Railplane, an early streamlined motorcar designed by aviation engineer William B. Stout. After examining both the engine and the motorcar at the Chicago World's Fair in 1933, Ralph Budd asked Edward Budd to build him a streamlined stainless-steel train, and Kettering to supply the engine to power it. Budd wanted his new train to get the public's pulse racing. It did. Flying along the tracks at record-breaking speeds, the Burlington Zephyr attracted crowds wherever it went. Nothing did more for business that the fabled "Dusk-to-Dawn Run" of May 26, 1934, when the Zephyr traveled the 1,015 miles from Denver to Chicago in an astonishing 13 hours and five minutes. By the end of the 1930s, passenger rail travel was fashionable again; Americans, like Chaucer's pilgrims, were inspired by the Zephyr. Yet despite Budd's accomplishments, passenger travel was never truly profitable; its lasting importance was as a public relations tool for an industry heavily regulated by government. Revival came during troubled times. In 1940, President Roosevelt sought the railroads' help in the war effort. Roosevelt still hoped to keep America out of combat, but he recognized a possibility that the government might need the railroads to mobilize American soldiers and equipment. In discussions with Budd, Roosevelt and Eastman raised the possibility of the federal government's seizing control of the rails as it had done during World War I. Budd suggested that the railroads be consolidated and mobilized through already-existing channels. On May 28, 1940, President Roosevelt named Budd his federal transportation commissioner. When America entered the war, following the Japanese bombing of Pearl Harbor, Hawaii on December 7, 1941, Budd and his industry were poised to make major contributions to the war effort. Budd's last day as president of the Burlington, August 31, 1949, was designated Ralph Budd Day at the Chicago Railroad Fair. 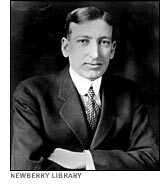 Of this unassuming man, the editor of Railway Age magazine said: "...His chief claim to fame is that he has been one of the most accomplished, progressive, and courageous administrators and business statesman who have ever devoted their talents to railroading."